DL: It was shot in the Koepel Panopticon Prison, Arnhem, in the Netherlands, May 23, 2011 at 8:44pm. HO: What were the conditions on site? DL: Stark, comfortable temperature, industrial lighting, quiet, smell of smoke and burnt food from a cell microwave. HO: Is there any technical aspect of the shooting that you want to point out? DL: I photographed the domed prison from the spot on the floor that allows for a near-perfect compositional contrast with my opera houses, which are shot from the spot at center stage where a performer would stand. I work with a large format camera so that I have the utmost control in making sure the composition of the image is architecturally symmetrical. I pay close attention to ensuring the lines are straight for perfect repetition and that the curves of the convolutions of ceiling and higher and lower catwalks are parallel and emphasize Euclidean geometry. With this camera, I am also able to flatten out space to make it look more like a painting. For instance, the industrial chandelier hangs down, but it looks askew, as if it is tilted toward you. I want the viewer to experience what it feels like to be surrounded by the space. HO: How did you get inside the site? DL: Through a barter agreement. DL: The panopticon. On first inspection, I don't believe that the viewer identifies the interior as a prison. The ceiling of the prison reminds me of the tartan pattern now made famous by Burberry. HO: Is there anything that you were trying to communicate through this photograph? DL: The domed prison is the closest example of Jeremy Bentham's Panopticon model of mass surveillance prison design - a central guard tower with a complete view of surrounding prison cells. This concept was designed so a central observer could monitor all of the prisoners at once, without any particular prisoner being able to feel under inspection. 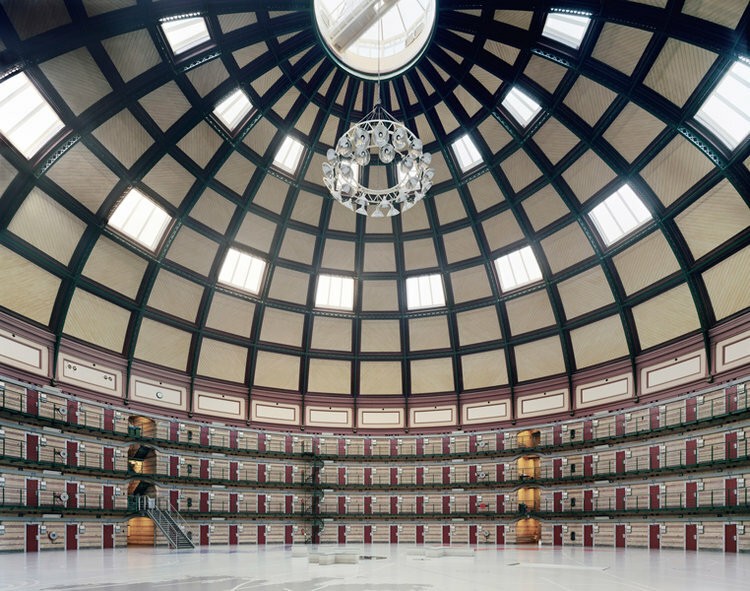 The domed prison has the same architectural structure as an opera house (without the opulence), but the difference is in who is observing whom. In an opera house, the audience of many is observing a few. In the domed prison, it's the reverse. David Leventi is NY based photographer.